Who is Geronimo Stiltonord?He is a mouseking -- the Geronimo Stilton of the ancient far north! He lives with his brawny and brave clan in the village of Mouseborg. 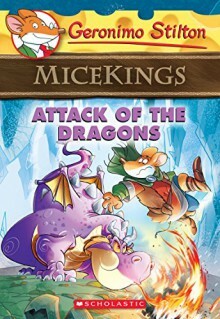 From sailing frozen waters to facing fiery dragons, every day is an adventure for the micekings! Attack of the DragonsThe micekings are in a panic. The village's best cook is ill, and until she recovers, there's no delicious stew to eat! Geronimo Stiltonord departs immediately in search of a cure for her. But on the way, he ends up snout-to-snout with terrifying dragons! Can he make it back with his fur intact?